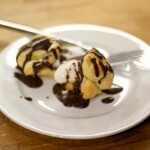 Even though they are surprisingly simple to make, these delicacies will always impress. 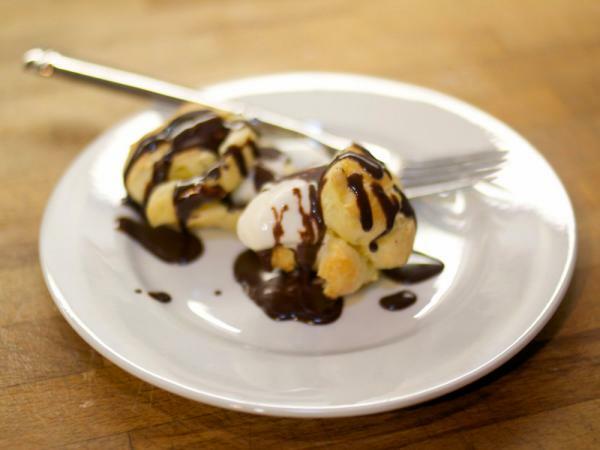 You can make just the profiteroles in advance, or make and fill them with ice cream, ready to pull from the freezer for last minute guests. In heavy, medium-sized saucepan, bring water, butter and salt just to a boil and then remove from heat. Add flour all at once and stir vigorously with wooden spoon until mixture comes away from side of pan in smooth ball. Reduce heat to medium-low and cook, stirring constantly, until coating begins to form on bottom of pan, 1 to 2 minutes. Transfer to bowl of a stand mixer and stir on low for 30 seconds to allow to cool slightly. On medium-low, beat in eggs, one-quarter at a time and beating well after each addition. Beat until smooth, shiny and pastry holds its shape in bowl. Fill a pastry bag fitted with ½-inch (1 cm) plain tip with pastry, or use a spoon pipe or spoon pastry into twenty-four 2″ x 1″ mounds onto 2 parchment paper-lined baking sheets. Beat egg with water and moisten finger tips with egg-water. Lightly flattening any edges or tips, making sure glaze doesn’t drip onto paper. Pour the milk into a saucepan and bring the pan slowly up to boiling point. Place the vanilla pod into it and leave to infuse for about 20 minutes. In a bowl, beat and mix together the egg yolks and sugar until thick. Carefully remove the vanilla pod from the pan of milk and scrape out the seeds into the milk. Pour the milk into the mixture of egg yolks and sugar whilst stirring. Pour the mixture back into the pan and heat gently, stirring until the custard thickens – DO NOT BRING TO THE BOIL OR IT WILL CURDLE. When you can see a film form over the back of your spoon, remove the saucepan from the heat and leave the custard base to cool. When cold stir in the cream. Transfer the whole mixture into an ice cream maker and freeze according to the manufacturer’s instructions. 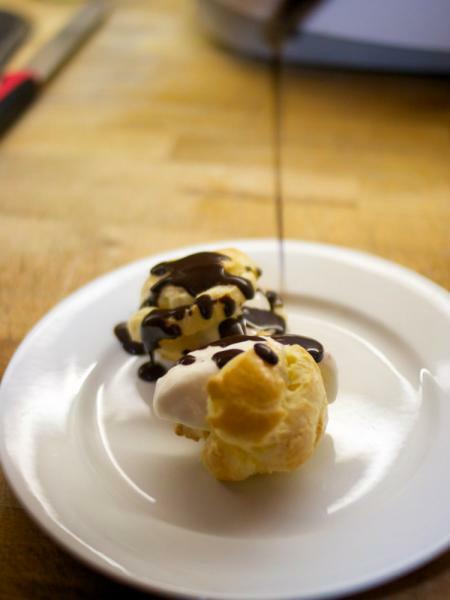 When the ice cream is almost finished thickening, add the crushed peppermint candy and freeze the ice cream until serving profiteroles. In saucepan, bring cream to boil and then pour over chocolate in bowl. Whisk until melted. 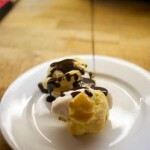 Split each profiterole in the middle, scoop some ice cream onto it and top with chocolate sauce. A Domestic Goddess original – based on a lot of recipes from various sources.